Today, Porsche announced the details of its all-new 911 Black Edition 2012. Based on Porsche 911 Carrera, the Porsche 911 Black Edition will be available in the spring 2011 and will be limited to a production run of 1,911 worldwide units. The 911 Black Edition will only be available in black, with two paint choices: Solid Black or the optional Basalt Black Metallic, with highlights provided by the 19 inch 911 Turbo II two-color wheels, their dichroic effect complementing the discreet elegance of the exterior color. The MSRP will be $81,300 for the Coupe and $91,300 for the Cabriolet. ATLANTA - January 25, 2011 - Based on the 3.6-liter, 345 horsepower (hp) 911 Carrera, the upcoming 911 Black Edition features a comprehensive list of standard equipment and will be available as a Coupe or Cabriolet and only in black. Exclusivity and price help make this new 911 Carrera distinctive as the 911 Black Edition will be limited to just 1,911 worldwide units. MSRP will be $81,300 for the Coupe and $91,300 for the Cabriolet, and they will be available in the spring of 2011. A wholly owned, indirect subsidiary of Dr. Ing.h.c.F.Porsche, Porsche Cars North America, Inc. and its 197 dealers offer U.S. customers some of the most technically advanced and high-performance vehicles in the world. 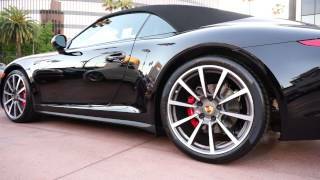 Porsche cars are synonymous with supreme quality accompanied by first-class customer treatment. Also, Porsche is fully and publicly committed to being a leader in significantly lowering emissions, and saving fuel. The company's guiding credo is “Porsche Intelligent Performance” and the goal is to prove that Porsche's high performance and efficiency are not contradictory terms. A dramatic example of this is the highly-anticipated 918 Spyder - a super sports car that is also a planned plug-in hybrid. Of course this is nothing new for Porsche, which for 63 years has developed numerous technologies that have advanced vehicle performance, improved safety and spurred environmental innovations. Obviously, one expects such achievements from the most revered race car brand in the world --- one that has accumulated more than 28,000 motorsport victories. Today, PCNA imports the cars that are the product of this great history, including the iconic 911 series, the renowned Boxster and Cayman mid-engine sports cars, the high-end Cayenne sport utility vehicles and the four-door Panamera Gran Turismo cars.